Background and Objectives: EUS-guided biliary drainage (EUS-BD) is increasingly utilized to manage unresectable malignant biliary obstruction after a failed ERCP. However, there is no data on how endoscopists perceive EUS-BD. The aim of this study was to investigate the perception of endoscopists on EUS-BD. Patients and Methods: A survey questionnaire of six topics with 22 survey statements was developed. A total of 17 pancreatobiliary endoscopists (10 from East and 7 from West) were invited to survey. The participants were asked to answer the multiple choice questionnaire and give comments. The opinions of the participants for individual survey statements were assessed using 5-point Likert scale. Results: All participants completed the survey. The endoscopists had a trend to perceive EUS-BD as a procedure indicated after a failed ERCP. Various EUS-BD methods were regarded as having different efficacy and safety. The superiority of EUS-BD over percutaneous transhepatic BD (PTBD) with regard to efficacy, procedure-related adverse events, and unscheduled re-intervention was not in agreement. Conclusions: EUS-BD was not yet perceived as the initial procedure to relieve the unresectable malignant biliary obstruction. Various EUS-BD methods were regarded as having different efficacy and safety. The superiority of EUS-BD over PTBD was not in agreement. Refining the procedure, developing dedicated devices, and gaining expertise in the procedure are necessary to popularize EUS-BD. Current affiliation of Dongwook Oh is Department of Internal Medicine, Asan Medical Center, University of Ulsan College of Medicine, Seoul, South Korea. ERCP with biliary drainage (BD) is the standard management of unresectable malignant biliary obstruction.,, However, the failure rate of ERCP ranges from 5% to 7%. Traditionally, percutaneous transhepatic BD (PTBD) has been the standard procedure to relieve malignant biliary obstruction after failed ERCP. Since the first introduction of EUS-guided choledochoduodenostomy (EUS-CDS) in 2001, various EUS-guided BD (EUS-BD) methods have been developed. Recent meta-analyses demonstrated a high technical success rate of EUS-BD and clinical superiority over PTBD., However, some argue that EUS-BD is not frequently utilized, and the reasons for this are unclear. To the best of our knowledge, there is no study on how endoscopists perceive EUS-BD. The aim of this study was to investigate the perception of endoscopists on EUS-BD. We developed survey statements which encompassed various topics regarding EUS-BD. The survey statements were developed through a series of discussions. The Korean co-authors made the first draft statements with a review of literature. Initial draft included the topics of “Definition,” “Indication,” “Techniques” and “Outcomes.” On March of 2016, a meeting to develop the survey statements was held in Seoul, Korea. Eventually, the survey included six topics: (1) Definition, (2) Indication, (3) Resource Requirement and Training, (4) Techniques, (5) Outcomes of EUS-BD in Expert Hands, and (6) Areas of Further Research with 22 survey statements. The opinions of the participants for individual survey statements were assessed using 5-point Likert scale [Table 1]. The topics and statements are listed in [Table 2]. Two authors (WJY and DHP) were involved in the selection of the participants. Gastrointestinal endoscopists who participated in at least 1 study on EUS-BD were screened. We excluded endoscopists with extensive publication on EUS-BD, as this person might be biased in favor of EUS-BD. A total of 17 pancreatobiliary endoscopists (6 from Korea, 4 from Japan, 3 from Spain, and 4 from the United States) with various experiences in EUS-BD were selected as participants. These endoscopists had at least five cases of EUS-BD procedures in their endoscopic career and one publication (full-length article or abstract form) regarding EUS-BD. The questionnaire was sent to the participants through E-mail. In addition to answering the multiple choice questionnaire, the participants were asked to freely give any comments that they had for individual survey statements. This study (IRB No. 2017-1331) was considered nonhuman subjects research by the Asan Medical Center Institutional Review Board and was exempt from review. The score of each survey statement is presented as mean ± standard deviation. The analysis of variance (ANOVA) was performed to check if there was any significant difference among the mean score of survey statements. Pairwise comparison using the Tukey's method was done to see which statements had significantly different mean scores. A two-sided P < 0.05 was considered statistically significant. Statistical analyses were performed using STATA 12.1 (StataCorp LP, College Station, Texas, USA). All 17 invited endoscopists completed the survey (100% response rate). The overall mean scores of the survey topics ranged between 3.5 points and 4.7 points. The topic of “Outcomes of EUS-BD in Expert Hands” had the lowest overall mean score. ANOVA of the overall topic mean scores showed that there was a significant difference in these scores (P < 0.001). Pairwise comparison using Tukey's method showed that the overall mean score of the topic of “Outcomes of EUS-BD in Expert Hands” was lower than that of other topics. The mean scores of the survey statements ranged between 3.1 points and 4.9 points. The mean scores were higher than 4 points for all the statements in the topics of “Definition,” “Resource Requirement and Training,” “Techniques,” and “Areas of Further Research.” For the topic of “Indication,” the mean scores were higher than 4 points except for statement 2.3, the mean score of which was 3.9 points. 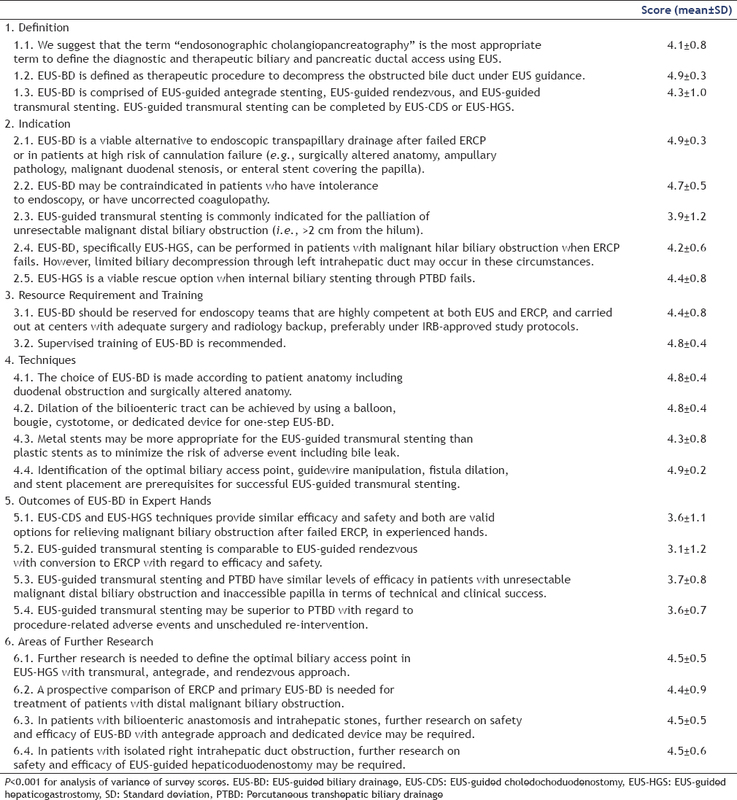 Of interest, the mean scores of all statements in the topic of “Outcomes of EUS-BD in Expert Hands” were <4 points, reflecting the conservative view toward the EUS-BD. ANOVA of the survey statement scores indicated that there was a significant difference in the mean scores (P < 0.001). Pairwise comparison of the means using Tukey's method indicated that the mean scores of the survey statements 2.3, 5.1, 5.2, 5.3, and 5.4 were significantly lower than that of at least 1 survey statement with a mean score higher than 4 points [Table 2]. For topic 2, the mean scores were higher than 4 points except for statement 2.3 (mean score 3.9 points). In response to this statement, the participants commented that EUS-BD is indicated only when ERCP is not possible and not as the primary procedure. The mean scores of all the statements in the topic 5 were <4 points, likely reflecting the overall conservative view of the group toward the EUS-BD. Most participants were concerned about the paucity of evidence. Various EUS-BD methods were perceived as having different efficacy and safety. For survey statement 5.1, the participants were in favor of EUS-CDS over EUS-guided hepaticogastrostomy (EUS-HGS) regarding stent patency, safety, and learning curve. The result of survey statement 5.2 indicated disagreement on safety issues between EUS-guided transmural stenting and EUS-guided rendezvous. The participants who gave personal comments on this topic stated that although EUS-guided rendezvous may be less effective, it may be safer than EUS-guided transmural stenting. Survey statements 5.3 and 5.4 sought to compare the perception of endoscopists on EUS-guided transmural stenting with that of PTBD. The superiority of EUS-BD over PTBD was not in agreement. Some participants commented that PTBD is more widespread than EUS-BD and that there is a lack of evidence to directly compare the procedures. The purpose of this study was to investigate the perception of endoscopists on EUS-BD. Most participants (1) considered EUS-BD to be a procedure indicated after failure of ERCP, (2) did not agree that various EUS-BD methods had similar efficacy and safety, and (3) did not agree that EUS-BD is comparable or superior to PTBD. Selective biliary cannulation in patients with native upper GI anatomy is successful in more than 90% of procedures by expert endoscopists. However, bile duct access cannot be achieved due to various reasons such as failed biliary cannulation, gastric outlet obstruction, altered anatomy, and periampullary diverticulum. In such situations, PTBD has been widely utilized. First introduced by Giovannini et al. in 2001, EUS-BD has been increasingly utilized when ERCP fails. A recent meta-analysis demonstrated technical success rate of 90% and postprocedure adverse event rate of 17%. In this analysis, distal CBD stricture and transpapillary drainage were associated with higher technical success rate; intrahepatic access was associated with higher adverse event rate. Another meta-analysis reported cumulative technical success rate, functional success rate, and adverse-event rate of 94.71%, 91.66%, and 23.32%, respectively. Transduodenal and transgastric approach did not show statistically significant differences with regard to these parameters. A meta-analysis comparing EUS-BD and PTBD after ERCP failure showed that EUS-BD was associated with better clinical success and lower rate of reintervention compared to PTBD. A survey on patient preference between EUS-BD and PTBD after a failed ERCP showed that about 80% of the patients preferred EUS-BD to PTBD; they were willing to undergo EUS-BD if EUS-BD expertise was available and adverse event rate was lower than that of PTBD. However, although EUS-BD is gaining popularity, there has been argument that EUS-BD is not so frequently utilized even in centers with high-volume of EUS intervention. In a report in a letter format, Tonozuka et al. reported that of 634 endoscopic BD cases performed in a year, only 21 (3.3%) EUS-BD-related procedures (19 EUS-BD and 2 rendezvous) were conducted to achieve BD. In this report, 7 PTBD-related procedures (3 PTBD and 4 rendezvous) were done. In our study, the participants were in favor of ERCP as the initial choice for palliation of malignant distal biliary obstruction. As there is no head-to-head direct comparison of ERCP and EUS-BD, this result may be taken as a matter of course. A prospective comparison of ERCP and EUS-BD for palliation of malignant biliary obstruction is being conducted, and it would be interesting to see the results. The participants gave low scores for the survey statements on the topic of “Outcomes of EUS-BD in Expert Hands.” It seems that most participants regard EUS-guided rendezvous as a safer procedure compared to EUS-guided transmural stenting. EUS-CDS was perceived to be safer than EUS-HGS. Despite the available data, the participants were conservative with regard to comparing EUS-BD and PTBD. Since most of the studies on EUS-BD have been conducted by a single experienced endoscopist, the high success rate and low adverse event rate may not be generalized. Although there is growing evidence of the clinical usefulness of EUS-BD, there are hurdles for endoscopists to comfortably perform EUS-BD in clinical practice. One of the limitations to wide-spread use of EUS-BD is that it is still regarded as a complex procedure. It involves puncture, guidewire manipulation, fistula dilation, and stent deployment. In the study by Oh et al., the number of procedures required to stabilize the procedure time and adverse events of EUS-HGS was 33. Lack of devices dedicated to EUS-BD added to the difficulty in widespread utilization of EUS-BD. A recent study comparing EUS-BD and ERCP for primary palliation of malignant biliary obstruction indicated that the use of a dedicated one-step device for tract dilation and stent introduction resulted in the decrease of the risk of bile leak and delayed luminal injury from electrocautery. It also resulted in shortened procedure time. As EUS-BD is usually done after a failed ERCP, it would take a long time to gain expertise. Another hurdle is the possibility of serious complications. In the Spanish national survey, of 125 patients who underwent EUS-guided cholangiopancreatography, complication occurred in 29 patients (23.2%). The complications were bilomas (n = 7), hemorrhages (n = 6), perforations (n = 4), acute pancreatitis (n = 5), cholangitis (n = 3), liver hematomas (n = 2), abscess (n = 1), and pancreatic pseudocyst (n = 1). Five patients (4%) died as direct consequences of the complications. There were limitations to this study. First, the number of survey participants was too small to adequately represent the perception of EUS-BD among the endoscopists of the East and West. A larger group of survey participants, preferably with diverse spectrum of experiences in EUS-BD, may have provided a better information on the real-world perception of the procedure. Second, the regions where the participants practiced were limited. The regional differences in experience and resources may affect the results of the survey. However, we believe that this study is the first to address the real-world perception of EUS-BD in East and West. In addition, recently published consensus guidelines on the optimal management in interventional EUS procedures share similarities with our results on indications, resource requirement and training, and techniques. A substantial number of endoscopists in East and West surveyed did not believe the impact of EUS-BD in the management of biliary obstruction after failed ERCP. This limited awareness may represent a barrier to successful utilization of EUS-BD. Refining the procedure and developing dedicated devices with procedural expertise is necessary to make EUS-BD as a routine clinical practice. This research was supported by a grant from the Korea Health Technology R&D Project through the Korea Health Industry Development Institute, funded by the Ministry of Health and Welfare, Republic of Korea (HI14C0139). Buffet C, Couderc T, Fritsch J, et al. Palliative treatment by endoprosthesis of icterus caused by distal biliary tumoral obstruction. Gastroenterol Clin Biol 1993;17:629-35. Shepherd HA, Royle G, Ross AP, et al. Endoscopic biliary endoprosthesis in the palliation of malignant obstruction of the distal common bile duct: A randomized trial. Br J Surg 1988;75:1166-8. Andersen JR, Sørensen SM, Kruse A, et al. Randomised trial of endoscopic endoprosthesis versus operative bypass in malignant obstructive jaundice. Gut 1989;30:1132-5. Coté GA, Singh S, Bucksot LG, et al. Association between volume of endoscopic retrograde cholangiopancreatography at an academic medical center and use of pancreatobiliary therapy. Clin Gastroenterol Hepatol 2012;10:920-4. Voegeli DR, Crummy AB, Weese JL. Percutaneous transhepatic cholangiography, drainage, and biopsy in patients with malignant biliary obstruction. An alternative to surgery. Am J Surg 1985;150:243-7. Khan MA, Akbar A, Baron TH, et al. Endoscopic ultrasound-guided biliary drainage: A systematic review and meta-analysis. Dig Dis Sci 2016;61:684-703. Sharaiha RZ, Khan MA, Kamal F, et al. Efficacy and safety of EUS-guided biliary drainage in comparison with percutaneous biliary drainage when ERCP fails: A systematic review and meta-analysis. Gastrointest Endosc 2017;85:904-14. Khashab MA, Levy MJ, Itoi T, et al. EUS-guided biliary drainage. Gastrointest Endosc 2015;82:993-1001. Wang K, Zhu J, Xing L, et al. Assessment of efficacy and safety of EUS-guided biliary drainage: A systematic review. Gastrointest Endosc 2016;83:1218-27. Nam K, Kim DU, Lee TH, et al. Patient perception and preference of EUS-guided drainage over percutaneous drainage when endoscopic transpapillary biliary drainage fails: An international multicenter survey. Endosc Ultrasound 2018;7:48-55. Park DH, Lee TH, Paik WH, et al. Feasibility and safety of a novel dedicated device for one-step EUS-guided biliary drainage: A randomized trial. J Gastroenterol Hepatol 2015;30:1461-6. Park DH, Jeong SU, Lee BU, et al. Prospective evaluation of a treatment algorithm with enhanced guidewire manipulation protocol for EUS-guided biliary drainage after failed ERCP (with video). Gastrointest Endosc 2013;78:91-101. Oh D, Park DH, Song TJ, et al. Optimal biliary access point and learning curve for endoscopic ultrasound-guided hepaticogastrostomy with transmural stenting. Therap Adv Gastroenterol 2017;10:42-53. Paik WH, Lee TH, Park DH, et al. EUS-guided biliary drainage versus ERCP for the primary palliation of malignant biliary obstruction: A multicenter randomized clinical trial. Am J Gastroenterol 2018;113:987-97. Vila JJ, Pérez-Miranda M, Vazquez-Sequeiros E, et al. Initial experience with EUS-guided cholangiopancreatography for biliary and pancreatic duct drainage: A Spanish national survey. Gastrointest Endosc 2012;76:1133-41. Teoh AYB, Dhir V, Kida M, et al. Consensus guidelines on the optimal management in interventional EUS procedures: Results from the asian EUS group RAND/UCLA expert panel. Gut 2018;67:1209-28.